This time we’ve covered another milestone. 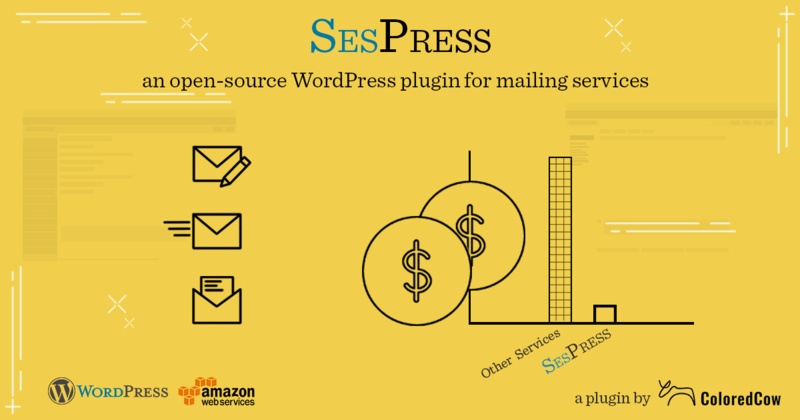 After all the effort made by the team to reduce our overall emailing cost and build a custom WordPress functionality, we’re happy to release it to the public as a WordPress plugin titled SesPress. This is one of the first open source projects that we’re planning to maintain long-term and add more features to the platform. We’ll be maintaining the source code, plugin versions, features and pull requests at the official Github repository for SesPress. This is our first contribution towards the WordPress community (never been this excited before). You can directly download the plugin from the official WordPress plugin repository or just search for SesPress from your project’s plugin dashboard. The primary factor that made us develop this plugin was the cost. We are a cost conservative organization and try to minimize our expenses wherever possible (until it kills the fun). Our Mandrill expenses were skyrocketing and we needed an immediate solution. After a lot of market research, we couldn’t find anything that can solve our purpose and can be cost efficient also, we built SesPress. Read here to know more about how SesPress was born. As expected, we had multiple prolonged discussions over the plugin’s name. Everybody threw ideas. WP SES, SES for WordPress, SES made easy, SES4U, SES WP Mail, Mail from SES and so on. Some were good, some were exactly opposite (I feel I was on the first side most of the times). Some names were already taken and some didn’t look good as a brand. After multiple rejections, we finalized SesPress as it represents both the underlying frameworks: WordPress and Amazon SES and was also looking clean. For more details and usage documentation, please go through the Github Readme. Gear up for the features in the first major release.